I had an amazing natural childbirth. Pain free? No. But it was definitely a comfortable, joyful, drug-free, loud, showed-more-skin-in-front-of-my-sister-than-I-wanted-to kind of birth. I had worried for nine months about every possible complication, and in the end we had a perfect baby boy who was born without any problems–just like Matt predicted. Some people thought we were crazy for having a natural home birth, and others said they were inspired. We were just thrilled to be able to create our own comfortable space into which we welcomed our baby. Over the past seven weeks we’ve been loving on our new squishy baby, and also figuring out which baby gear is a necessity. Babies don’t need much, but we’ve found that there are certain things we appreciate having. I’ll share a few cool new finds with you today. I’m not saying that the little babe has colic, but he definitely has some periods of extreme stomach discomfort, gas, reflux, and crying that prevents him from sleeping and being comfortable. Matt did tons of research on the best natural remedies for babies because we wanted the most natural help for him. Cloth diapering has always sounded a bit intimidating, even though I knew I wanted to use them for my child. There are so many different types of reusable diapers out there, and so much information that it can make your head spin. 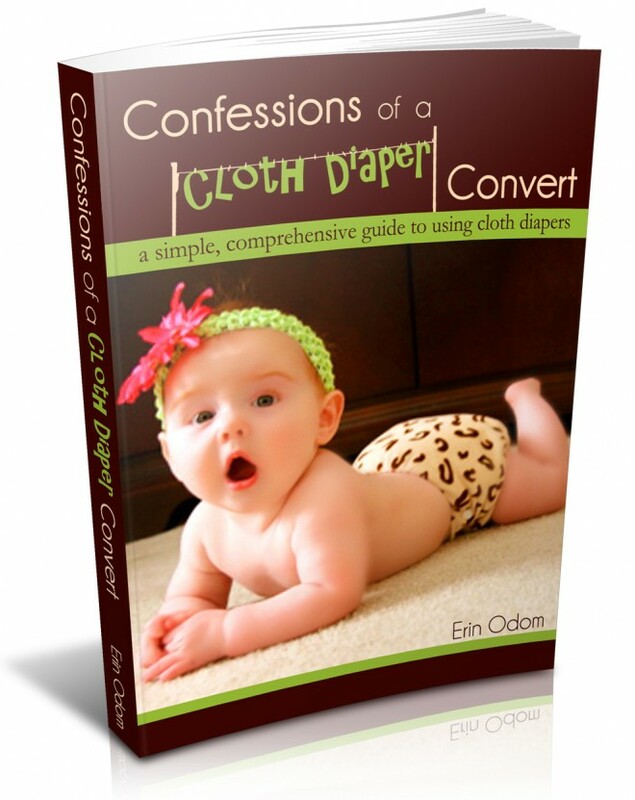 Luckily, I had read the eBook Confessions of a Cloth Diaper Convert even before getting pregnant, and it helped me decide cloth diapering was no big deal. When I found out I was pregnant, it was one of the first resources I returned to. It helped me register for cloth diapers, figure out how to take care of them so they last, and generally give me encouragement to cloth diaper with my first baby. In the end, I love the diapers I ended up choosing, and cloth diapering is really kind of a cinch. But I really think I would have struggled more had it not been for this first eBook I read on the subject. You can get this cloth diapering eBook here. Do you know about the healing properties of amber? Several years ago a friend of mine explained to me why her baby was wearing an amber necklace. (I thought her baby was trying to make a fashion statement.) Amber is a natural pain relief remedy for teething babies. A few weeks ago I got a tiny little amber bracelet for Titus, and I plan to get a matching necklace too. They’re super cute and I’ve heard great things from mothers who used them with their babies. Amber is a fossilized resin, not a stone. It is warm to the touch and light to wear. When amber is worn on the skin, the skin’s warmth releases healing oils from the amber which are then absorbed via the skin into the bloodstream. Amber’s anti-inflammatory and therapeutic properties have long been appreciated by parents in Europe. I was really excited to take a natural childbirth class before giving birth. I wanted to meet some likeminded couples and learn as much as I could to prepare for the birth. Here’s the thing… we paid $130 for an eight-week natural birthing class, which we never got to finish. 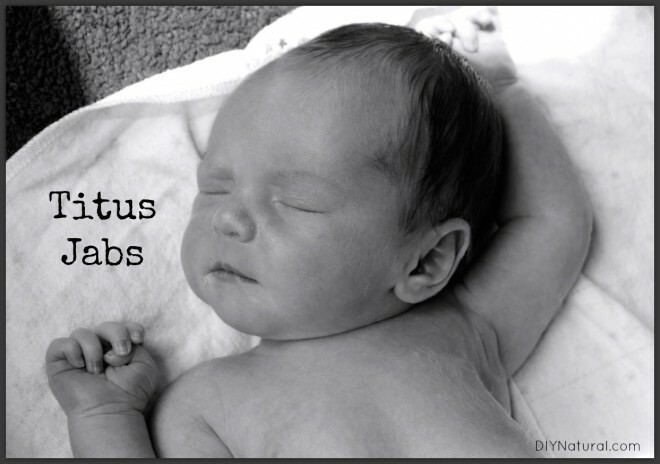 Titus arrived two and a half weeks early, and we missed two of our childbirth classes. (I know, you’re thinking we should not have cut it so close to the birth, but we had no choice. We had just moved back to our home state and it was the first available class.) In fact, as I was in the birthing tub pushing, Matt leaned over and said, “Does this mean we don’t have to go to our childbirth class tonight?” I felt kind of gypped. Not only did I want to get our money’s worth, but I was really learning a lot from the class and loved attending. So when I learned about an audio birthing class a few weeks ago, I was a little bummed I didn’t find it sooner. The MamaBaby Birthing Class is also an eight-week class, and is geared toward those who are planning a natural birthing experience. You can complete the class at your own pace, instead of being at the mercy of an instructor’s schedule like we were. Had I known about this course, I could have started it long before we moved and completed it with lots of time to spare before baby arrived. The class outline looks almost identical to that of the class we took, but there is so much more offered with the MamaBaby Course. You get menu plans for healthy eating, personal support for questions, downloadable references, and personal support for questions during the course. (Oh, and it’s only $97 compared to the $130 we spent on our course.) I highly encourage anyone thinking about a natural childbirth to look into this resource… it really looks awesome! Congratulations on your bundle of JOY! Love the name Titus..!! I will be a first time Nana this October and am looking forward to using all natural remedies for his maladies…tytytyty so very much for your post and helpful solutions to this complicated world… I was wondering where I can find a list of EO’s that can be used on a newborn for various situations and their applications …tytyty again!! Congrats to you, soon-to-be Nana! 🙂 As far as EOs for newborns, you really have to be careful. EOs are very strong and can be overwhelming for their tiny little bodies, and have to be VERY diluted. I actually read somewhere that the best way to use EOs with babies is to put oils on yourself and then hold the baby near the application site. 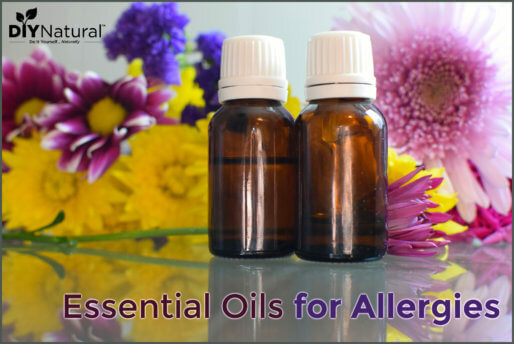 This way the baby can get the aromatherapy benefits without having oils on their skin. However, I do use oils in his homemade wipes, baby powder, diaper salve, and soap. I always go by the TLC rule… I use only tea tree, lavender, and chamomile for my baby. Once he’s a little older I’ll begin using some of the other oils. Hope this helps! Congratulations!! We had our latest addition at home on June 28th (last two babies were delivered at home, five in the hospital). My husband and I agree that it would have been better to have them all at home. It is so much more peaceful for all involved and healthier. I would also like to say I would be careful with putting anything around little babies necks and wrists. I have heard of little ones choking. I am wondering is there is another way to use the amber. Just a thought. Enjoy your little one. Children are a true gift from God!!! Blessings on your family!! I absolutely agree! I believe most women with low-risk pregnancies can safely deliver at home. It was extra special having my baby in the comfort of my own home. I had to say Congratulations on your new baby boy! I had all 5 of my babies at home and loved it! So again, Congratualtions! He’s adorable. Congradulations. I just became a new grandma last month and I sent my Son the amber bracelet idea you posted. Thanks so much for all your ideas and many blessings for your son and you both. Congratulations!! He is a handsome little fella! And good job on having him at home…..
Congratulations! He’s precious 🙂 I also welcomed my son into the world on July 29th! The last seven weeks have been amazing for me as well. What a special time! Thanks for the recommendation of the Colic Relief from TriLight Health…I was looking into Gripe Water but didn’t like the ingredients, so this sounds like a much better option for those nights when the little guy just isn’t feeling great. Congratulations!! Children are such a blessing! … I have a question about the ebook bundle. For the “bonus” items, will we have to pay shipping or other fees for those? Or is it included in the $30? You have to pay shipping for some, others you don’t. Click this link for more details, they explain it pretty well. Blessings! Congratulations!!! I have been beyond blessed to have been present for MANY water births (in a birth center but not at home). It is a miraculous event and I am thrilled it went without complication for you. Congratulations on the beautiful baby boy that has joined your family. what a lucky little fellow to have two such creative, talented parents. He is in great hands and consciousness as he starts his journey here. Many blessings on your journey together as a family. Congratulations on your new little baby boy! What a beautiful one he is too. I am so glad you had such a wonderful experience with the birth. Congrats to you and yours! I did home births for my children many moons ago (in the 70s). Cloth diapers were the only option for me and they were super easy to use/maintain. Wishing you a wonderful journey with little Titus. Don’t blink – he’ll be 18 before you know it! Congratulations! I can’t comment on the healing properties of amber, but a word of caution about putting a necklace on a baby. They can be a choking hazard. It’s also why it’s not recommended to put a pacifier on a ribbon or string around a baby’s neck. Even older infants can get tangled up in it. I am a child care professional who teaches health and safety to child care providers and sadly hear horror stories far too often. A little precaution can go a long way, especially with a precious bundle. I am really happy for you. We have 11 grandchildren and know that children and grandchildren are a true gift from God. I wish you the very best and want to thank you for all the help and guidance you give to all your readers. I used cloth diapers and LOVED it. Be careful of all the naysayers. I even had one daycare worker refuse to take care of my baby if I didn’t use disposable! I had to give a little “lesson” to the workers there. Bravo and yay for you!! Awwwww, what a cutie! Welcome to the world, sweet baby boy! I’m glad all went so well for you as you brought your son into the world. Congratulations to all! And welcome back to the beautiful state of Michigan!